Cincinnati-style chili. You either love it or hate it and as a native, I’m not going to argue with you in a quest to get you on board. It is chili unlike any other kind, it is a topping served on top of spaghetti, hot dogs, baked potatoes and fries and in burritos. Sometimes with beans and onions. And it is today’s featured dish for our restaurant week. 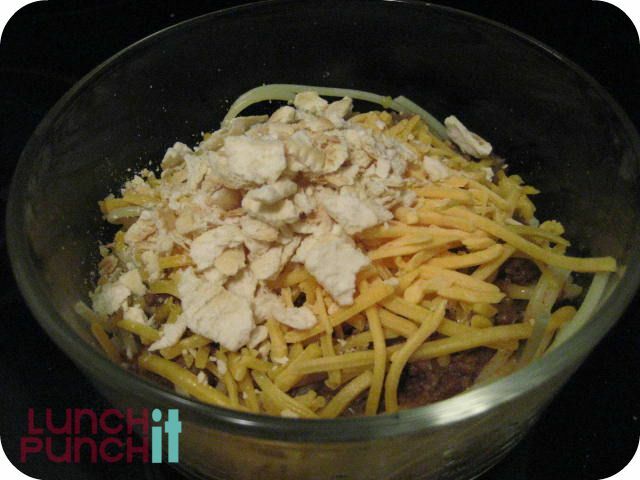 With Cincinnati chili available in grocery stores and just about everyone’s family has a recipe, you do not have to give up your weekly trip to the chili parlor just because you are packing a lunch. I like cheese coneys, chilitos and 3-ways (pictured), which is a spaghetti, chili and shredded cheddar cheese. When I pack a hot bun, a hot dog, a little bowl of chili, shredded cheese and if I’m lucky there is mustard in the fridge, I assemble a cheese coney at lunch. A chilito is chili and cheese tucked in a warm tortilla. Is healthy? NO! Does it make me happy? YES! By the way, Cincinnati and Northern Kentucky friends March 11-20 is Greater Cincinnati Independent Restaurant week.